Still waiting on pictures for other staff...refer to ministries tab to see who is doing what...in all honesty, the staff of this church is about 75 people. That is about half of who calls this place home. We are truly blessed to have so many willing to make a difference in this church, community and world. As for us...Sheri has been involved in ministry from a child on up. She has travelled the world singing and ministering the Gospel of Christ, loves the Lord and His people, and is indispensible to what God is doing here. She is very prophetic, and carries a powerful mantle of her own. She is a graduate of Evangel University in Springfield, with a Bachelor of Business (Accounting), and almost a double major in music. She is an anointed song writer and singer, leads the choir, teaches Sunday School, and ministers the Word (besides everything else). She is currently working on 2 Masters programs, one in Christian Counselling, and one in Practical Ministry. Sheri is also an Accountant, and an Enrolled Agent, licensed to represent clients before the IRS, among other credentials. Bill loves the Lord, and has been involved in ministry also since childhood. Whether it was being involved in the youth group, leading FCA's at school, visitation work with the Pastor, or going on a missions trip overseas at age 16, Bill was hungry. This continued on later in his life, at college, as a founding elder of West Point Full Gospel Fellowship. Bill graduated from West Point (USMA) in 1990 with a Civil Engineering degree, and became an Army officer serving in Desert Storm and in Europe. He was privileged to marry Sheri in August of 1991, and together they established a Sunday School program at the post chapel for soldiers and their families in Germany. 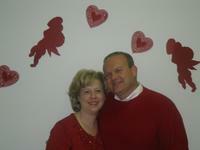 After finshing a tour of duty overseas, Bill and Sheri settled in Salem Missouri in 1993. Bill became involved in various ministries such as: cutting church grass, teaching sunday school, serving on board, hospital visitation, serving as spiritual elder, musician, and occasional speaker. Bill and Sheri became the Pastors of Salem Full Gospel Church in 2000. Bill also earned a Masters of Theology (ThM) Degree from Jacksonville Theological Seminary (Florida Campus) (JTS.edu) in 2001, and a Doctorate of Practical Ministry (DPM) from the Wagner Leadership Institute (Colorado Campus) in 2008. Bill also works part time in their financial planning business, holding many credentials and licenses in that field. Bill has remained involved overseas as well, teaching in conferences in various parts of the world where the Church supports ministry training centers. Bill and Sheri are also the founders of the Lifeway Center (local community ministry organization with a large food pantry operation), and Yeoman Ministries Intl (a training and equipping ministry). Yeoman is defined as a servant in a royal household. Bill and Sheri also are Chancellor and Dean of WLI Heartland (ministry training center). Bill and Sheri's greatest joys are loving God, and serving His people.